Sure, there are some challenges when it comes to travel and a gluten-free lifestyle, but there are also many opportunities for discovering new foods and cultures! As I travel, I document great restaurants and gluten-free opportunities for others. When my mother, sister, and I planned a trip to Vegas, I didn’t have high hopes for great gluten-free dining. My sister, however, did a bunch of research — okay, my sister hit Google for a few minutes — and discovered great news: both of us could safely eat in Las Vegas. I, being me, perused the list; she, being her, made a list and lead us on a culinary trip of sorts. The first thing we learned was that there is a high-level of gluten-free awareness in the restaurants in hotels on the Strip (we didn’t venture off the strip this trip as it was August, and we were playing it on the side of staying as cool as humanly possible). This is great news for everyone. Well-trained restaurant staff make life so much better for those of us who are gluten free! Border Grill. Border Grill, which is local to Los Angeles, is a family favorite, and I’ve eaten safely (and gluten free) there many times. My husband and I are huge fans of the Green Corn Tamales. Specializing in Mexican dishes, you can get great variety for lunch and dinner. Just don’t fill up on the chips and salsa before your meal arrives! Gluten-free menu items are labeled “GF” on the menu (there’s also a GF menu, if you prefer), making it easy to identify your choices, but do tell your server you’re gluten free. Mandalay Bay, 3950 Las Vegas Blvd S, Las Vegas. 702/632-7403. 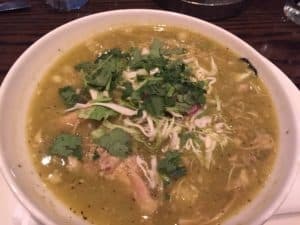 The just-spicy-enough gluten-free posole at the Border Grill in Las Vegas was the perfect end to the day. Joe’s Seafood, Prime Steak and Stone Crab. Well, no question about what they here, right? Request the gluten-free menu, and know that many of the offerings are naturally gluten free. The Forum Shops as Caesars, 3500 Las Vegas Blvd S, Las Vegas. 702/792-9222. Marche Bacchus French Bistro. A French bistro that features GF French Onion Soup and Steak Frites, among other options. Definitely a place for a romantic dinner. Desert Shores, 2620 Regatta Drive #106, Las Vegas. 702/804-8008. Mon Ami Gabi. My sister made a beeline for this restaurant the moment we entered the facility. No stopping to enjoy the fake Parisian streets, or the charming little shops. Nope, she was hungry (as were Mom and me). 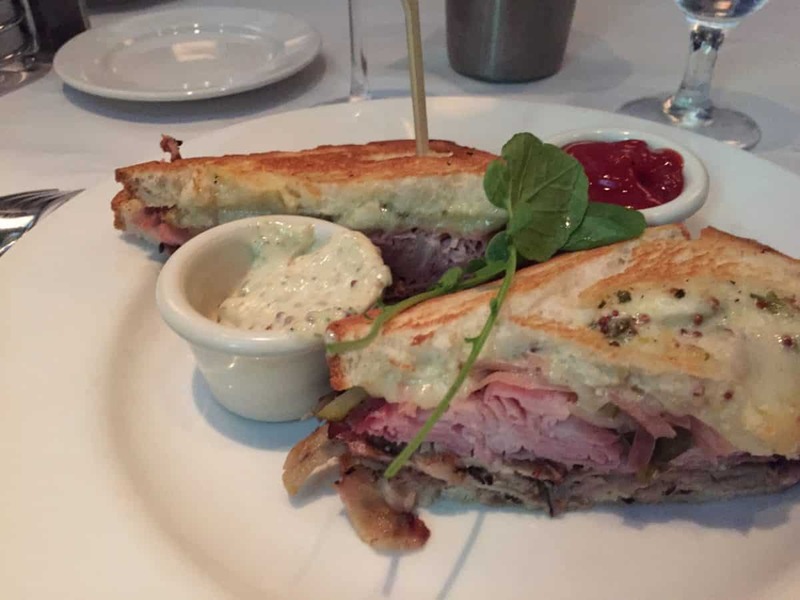 I had an amazing Cubano on gluten-free bread. My sister loved the cheesecake for dessert. The gluten-free menu was varied, and our server was amazingly helpful. You can even get gluten-free bread to start your meal. Paris Las Vegas, 3655 Las Vegas Blvd S, Las Vegas. 702/944-4224. MOzen Bistro. MOzen Bistro offers up a variety of items to help you get your Asian food fix, including Pad Thai and XO Fried Rice. Request a gluten-free menu. Mandarin Oriental, 3752 Las Vegas Blvd S, Las Vegas. 888/881-9367. Nine Fine Irishmen. We’d eaten at Nine Fine Irishmen on previous trips, before either my sister or I realized gluten was a problem. And it appears I dined gluten free without realizing it! Shepherd’s Pie, Lamb Stew, and other entrees are gluten free. The atmosphere is pure Irish pub, Vegas style. Request a gluten-free menu. New York, New York, 3790 Las Vegas Blvd S, Las Vegas. 702/740-6463. Onda Ristorante and Wine Lounge. This is a great choice on the Strip if you’re craving gluten-free pasta. Seafood and steak entrees are also gluten free. Make sure you inform your server that you are gluten free. Mirage, 3400 Las Vegas Blvd S, Las Vegas. 702/791-7354. Roy’s Restaurant. Roy’s is another household favorite, because the food is delicious and Roy’s commitment to accommodating gluten-free guests makes my life so much happier. Nine times out of ten, I go straight for the short ribs, but that tenth time, I get wild and creative! Seriously, the short ribs. Or everything else on the menu. Request the gluten-free menu. 620 E Flamingo Rd, Las Vegas. 702/691-2053. Seabreeze Cafe. We hit the Seabreeze before a huge day of touristing. 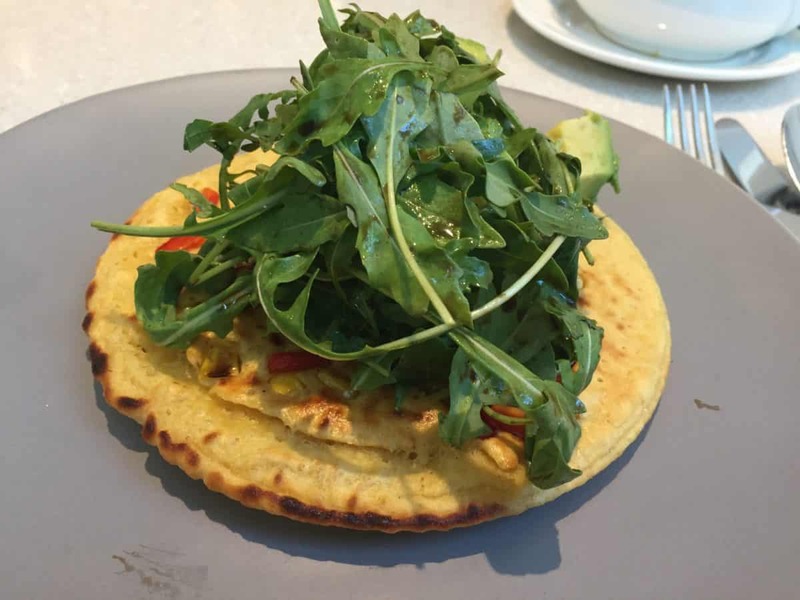 Great, filling, gluten-free breakfast. Our server was amazing at guiding us through the menu, and caught herself before asking what kind of toast we wanted… Mandalay Bay, 3950 Las Vegas Blvd S, Las Vegas. Slice of Vegas. Pizza, pasta, gluten-free, and vegan options. We were too tempted by the Burger Bar to eat here, but made a mental note for next time. The Shoppes at Mandalay Bay, 3950 Las Vegas Blvd, S, Las Vegas. 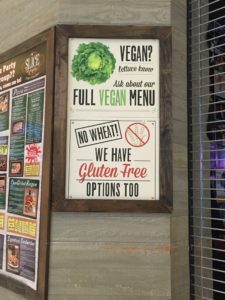 Slice of Vegas Pizzeria in Mandalay Bay makes it clear they have great gluten-free and vegan options for everyone. Top of the World. Lots of gluten-free options, but no separate gluten-free menu. Dishes are identified as gluten free on the regular menu, though some dishes may require modification. Work closely with your server to ensure your meal is safe to eat. Stratosphere, 2000 Las Vegas Blvd S, Las Vegas. 702/380-7711. Trevi. We had an amazing lunch featuring gluten-free ravioli with chicken. Seriously hit the spot. Other options are available. The Forum Shops at Caesars Palace,3500 Las Vegas Blvd S, Las Vegas. This is, obviously, not an all-inclusive list, so please share your favorites. And if anything changes, please let me know so I can update this post! 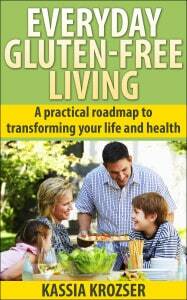 As always, take all regular precautions when ordering and consuming gluten-free meals in restaurants. None of the restaurants noted above have dedicated GF kitchens, so cross-contamination is always possible, despite the best precautions. Vegas has glammed up since the days of super-cheap all-you-can-eat buffets and not-great-food. Reservations are important if you’re traveling at peak times, or if you want to eat at a specific hour. Always check in advance to ensure gluten-free options are available. I admit it: we ate way more than we gambled. I’m not much of a gambler to start with, so this wasn’t a challenge. On my return home, I definitely needed a detox-type meal, especially since I’d had both a hamburger bun and a sandwich — way more carbs than my body is accustomed to eating in a single weekend. Yeah, this means what you think it means: big salads! Actually, since it was August, big salads were already on the menu. Since my husband hadn’t over-indulged in my option, I had to make a salad that would satisfy both of us. A steak salad was perfect. I loaded my plate with lots more greens while he did the same with the steak. Total win for both of us! Despite my vow to never go to Disneyland again, I succumbed to a friend’s request that I run the Tinkerbell Half Marathon with her. It was, I will admit, a relatively easy race (or as easy as 13.1 miles can be! ), and the energy of the crowd was amazing. Running through the park before the regular crowds arrived reminded me of my childhood. 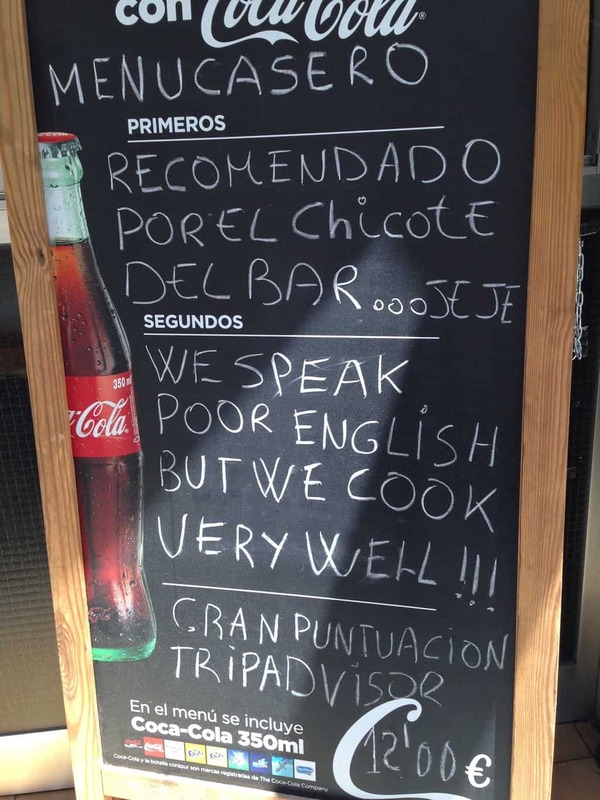 Be warned: Barcelona is a city designed for the hungry crowd. 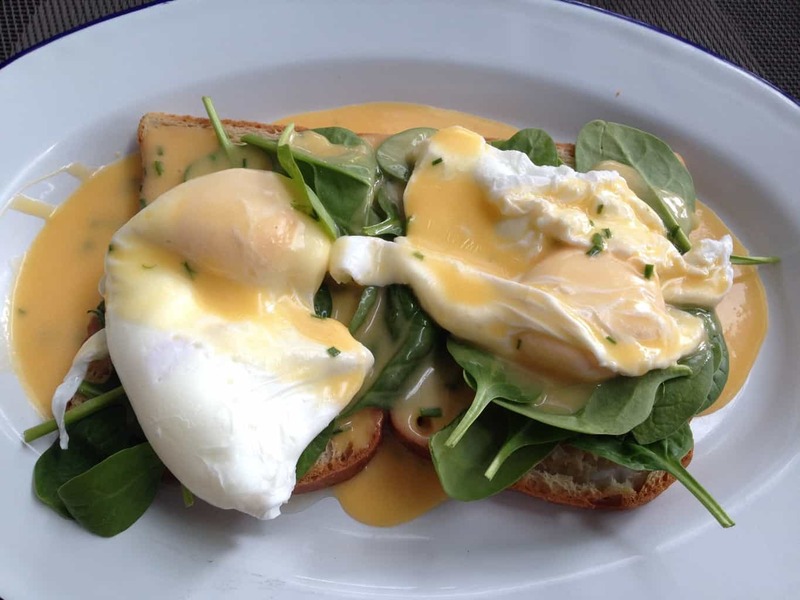 Restaurants and bars and cafes abound, and mealtime seems to stretch out all day — at one point, my husband noted there isn’t a fixed concept of breakfast, lunch, or dinner (though, if you’re looking for a full meal in the evening, note that many restaurants won’t even offer up a menu before 8 p.m., if not later!). Flying gluten-free can be challenging, but it can be done. As I take trips, I’m making notes of which airlines had great food, which airlines fell short, and how I managed various scenarios.